There are many paths to becoming a teacher of a second or foreign language: for some, it’s the natural progression from studying a language; others start by giving informal individual, private, or group classes or helping friends study their own language. Having lived in a country where demand for your language is high doesn’t count as concrete training, but it may make you realize that teaching is a skill worth developing. In the moment in which, in a constant and conscious way, someone starts to work in this field (not as mere fun or to help friends), this person becomes a language teacher and, in many cases, will become a professional who will develop their career throughout their life. However, being a language teacher isn’t simply about being a native and passing on knowledge to a greater or lesser extent — this is what language teaching manuals set out. When this happens, the teachers are limited to going over the content and activities that they have to do, just before the class, then interacting during and after the class with their students, and on a few occasions analyzing the development of their classes and evaluating the learning process. Being a language teacher goes further than mere repetition of instructions and activities with the language. The teacher should be able to analyze the entire language curriculum and know how to pass on this knowledge whenever it’s needed to all levels at a gradual pace, in accordance with the capability of each student. Only in this way do teachers achieve a solid, seamless learning foundation where students won’t suffer from frustration or anxiety when they are learning. Furthermore, teachers should be able to analyze and assess the manuals that they will have to work with, weigh up the proposed activities, and be able to use them, reuse them, and adapt them to the characteristics that differentiate each concrete group. They should even be able to create their own material that can be used to teach, reinforce, and clarify, these being specific teaching materials for communication and interaction activities that can cover and accomplish the needs of the students and can be adapted to different language levels. In this way, the teacher will not fall into the routine of merely transferring information. The more years teacher are in this profession, the more capable they will be of analysis; therefore, there will be more scope to be creative and adapt to the interests and needs of the students. In contrast, being a teacher in whatever area is about accepting the constant need for training. As a surgeon should do research her whole life because medical advances and new technology allows her to discover new tools, a teacher should take the same measures. The starting point is to know that a language teacher doesn’t just pass on theoretical knowledge but should be an actor who teaches students through the use of her own language in a descriptive and practical way, explaining why, when, and how for every communicative use. The second stage will be the ability to adapt to each teaching level, being able to pass on information whenever it’s needed, so that the student can use it with the level they have. For example, if teachers give beginner classes, they must be able to overcome the difficulty that teaching involves when the student lacks knowledge of the target language, which in turn complicates the student’s understanding of explanations. Therefore, this will make the teacher give more visual and imitative explanations, and more importantly, be more intuitive than in any other phase of teaching/learning. It is pointless if teachers know what to explain, but don’t know how to make themselves understood. Nor can teachers assume when starting a new topic that a student already knows the content, especially if the student hasn’t previously been in the class. It doesn’t matter what similarities there are between the native language of the student and the language being studied; sometimes this similarity makes the student learn incorrectly. The teacher, when explaining a language, should do it from the point of view of a “knowledge builder,” from the most basic to the most complex phase making sure that at each level the student can take in the concept and can use it correctly. Teachers should also be able to assess and evaluate the learning process of students in an objective manner. By doing this, they will be capable of identifying when students don’t know or make errors in the language due to their level of understanding or because the teacher hasn’t explained something correctly. In the first case, the teacher should find ways to motivate the student, and in the second, through self-criticism, the teacher should correct this error to avoid it prevent it from happening again. How can all this be achieved? As previously mentioned, a teacher is like a surgeon or a builder, in constant training. A teacher can give classes to students of different ages: children, teenagers, young people, adults, and seniors. The first thing a teacher should do when faced with a group is identify the age and different interests and then to adapt to them by using resources that they are familiar with, such as technological and cultural aids. For this reason (amongst others), one of the continuous tasks of the professional development of teachers is to be aware of new technology. This doesn´t mean teachers have to become experts in new technology, but they need to know how to use it and adapt it to their own needs. Although sometimes it can be particularly difficult to follow the advances, the teacher must always be able to assess the usefulness of such technology and use it adequately. Teachers must avoid breaking away from the reality in which we live, the reality in which their students live. The internet for example, allows us to be continually informed and use it whenever we want, accessing real material and real language samples about any topic and in any format, written texts, audio, and more. It also allows us to do distance learning: it allows us to give language courses to our students and to do training or re-training courses. This means we’re not just talking about the technique of the teaching service but also the learning process; the internet is a supplier and facilitator of teaching means. If we group together all these resources, a course for teachers can, for example, teach us to find real language samples, show us how to use them, and, in the necessary case, show us how to adapt them to lower learning levels. Let’s assess the training and retraining of teachers as another logical route to improvement. How do the training and retraining courses help? For a teacher without experience, a course enables them to organize, understand, and pass on the necessary knowledge to be able to learn a language. They will learn that they have to teach “how” and “when,” and they will acquire the ability to analyze the language in a scientific way, which will in turn allow them to teach in a more conscious way. Furthermore, they will review materials, assess the uses of different mediums available to them — technical or not — and listen to experiences that will help them in the future. For a teacher who already has previous teaching experience, these courses will serve to share those experiences with other teachers who, at the same time, will share their own experiences. They will also be able to assess the activities carried out on the program and learn from their mentors (and classmates) new techniques, new materials, and new means of teaching. What’s more, if these courses are carried out in a country where the official language is the target language, the benefit will be even greater: the student-teacher will be continuously immersed in the language, making contact with native speakers of the country, and becoming used to teaching students of different nationalities, thus creating a more global view of language teaching. Technology and continuous training are only two possible routes for the development of a teacher. 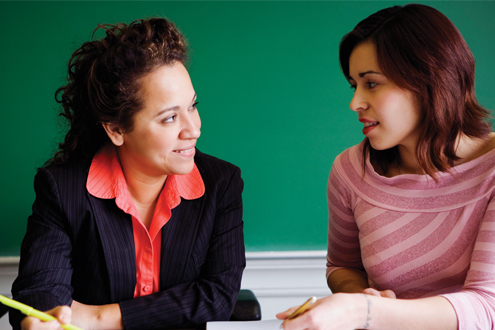 Teachers who have a reflective and receptive character are able to find new ways of teaching. Once this is achieved, they will be on the right path toward adequate professional development. And here more than ever, the path itself is the ultimate goal. Montserrat Villar González is head of teacher-training courses at Tía Tula Spanish School in Salamanca, Spain.